The fossilised remains of mankinds earliest known ancestor, predating previous discoveries by more than 1.5million years, have been discovered in Kenya. 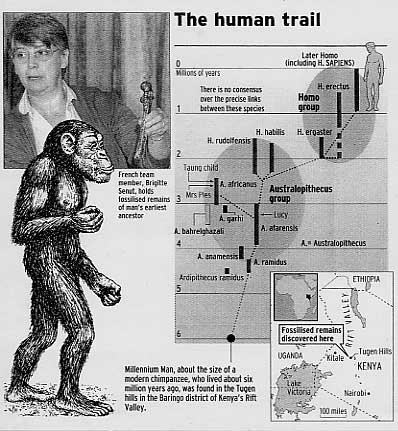 Millennium Man, as the apeman has been named, was unveiled yesterday by a team of French and Kenyan palaeontologists from the Kenya Palaeontology Expedition, who have unearthed remains from at least five males and females. About the size of a chimpanzee, Millennium Man shows characteristics that would not only allow it to walk on the ground, but also to feel at home in the trees. An almost perfectly fossilised left femur shows the creature had strong back legs, letting it stand erect. But a thick right humerus bone, from the upper arm, suggests it also had tree-climbing skills, though probably not enough to swing from limb to limb. But it is the teeth and jaw that most clearly link Millennium Man to modern humans, according to Dr Brigitte Senut, a team member form the Museum of Natural History in Paris. The apeman has small canines and full molars, similar to modern man, suggesting a diet of mainly fruit and vegetables, but also occasional meat-eating. Although the age of the remains has not been accurately established, the strata of earth from which they were recovered has been dated by independent teams from Britain and America to six million years. The first bones were found in the Tugen hills of the Baringo district, around 150miles north-east of the capital Nairobi, on Oct 25. The skeleton of Australopithicus afarensis  known as Lucy  found in 1974, is believed to have lived around 3.2 million years ago. Dr Chris Stringer of the Natural History Museum said although there would be debate over whether Millennium Man lay on the evolutionary path to humans, chimpanzees, or is an evolutionary dead end, so few remains had come from this period hat it would be significant in any event. Dr Pickford and Dr Senut said they were confident the team would unearth more, possibly older remains.